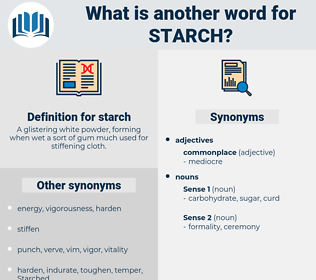 What is another word for starch? A glistering white powder, forming when wet a sort of gum much used for stiffening cloth. disablement, debilitation, impotence, exhaustion, indolence, enervation, laziness, slightness, lethargy, frailty, debility, faintness, impotency, prostration, powerlessness, feebleness, torpidity, delicacy, enfeeblement, listlessness, weakness, tenderness, puniness, frailness, infirmity, softness, sluggishness, inanition. The rich break their fast with a light meal, - a little bread and fruit, fresh or dry, especially water - melon, sweetmeats, or such digestible dishes as " Muhallabah," - a thin jelly of milk, starch, and rice - flour. 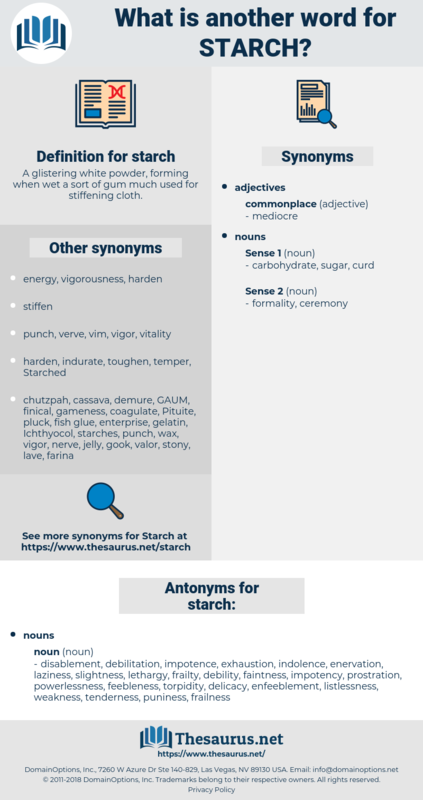 This is the test for starch. satyriasis, stroke, streak, studhorse, Saiga Tatarica, strike, store cheese, satyric, Starkey, sidetrack, strake, storage, siderosis, styracaceae, strachey, secateurs, satirise, struck, squeak through, schistorrhachis, sagittarius, streaky, sitotroga, stirk, stearic, steerage, strauss, scatter rug, Scut Work, see-through, stress, sistrurus, Skeeter Hawk, styrax, steerageway, stork, sheetrock, satiric, satirize, side horse, staircase, see through, strix, soak through, satureja, starchy, stargaze, stairs, storehouse, storax, stark.